Bali sterling silver adds a special touch to hand made beaded jewelry as well as chain maille designs. Bali is a small island in Indonesia. Centered on the village of Celuk are specialized silversmiths who produce world famous hand made sterling silver jewelry making items. Silver smithing has been carried out in this area for generations; many homes have their own production studio engaged in this specialized trade. These small studios produce a wide range of traditional bead designs with granulations or wirework decoration. Precious metal produced by the bead makers is then cut into sheets or drawn wire. These sheets and wire form the basis for the various bead designs. 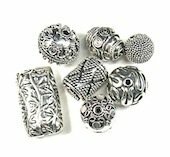 The range of items produced is quite large including beads, spacers, bead caps, connectors and other items, which are used quite widely to make glass beaded jewelry. Findings are a specialty, ear wires, head pins, chandeliers, toggle clasps, lobster claws, clasps, ear posts, lever backs, jump rings and bails are some of the items produced. These various sterling items can be used to make bracelets, earrings and necklaces. It can be combined with glass beads, Swarovski crystals, lamp work beads as well as in chain maille weaves, or used on its own. Gold plated sterling items known as vermeil are also quite popular. 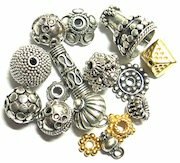 Some beads can be quite dark as many of them are oxidized to give an antique finish. Other beads may have a light oxidation applied. There is also a range of shiny beads. In recent times they have begun to produce large hole beads to fit Pandora bracelets. India and Turkey are producing copies of Balinese silver. Generally it is not up to the quality of genuine Celuk silver, if it is sterling at all. It is wise to purchase your silver items from reputable suppliers only. I have been buying my silver directly from Indonesia for some years and have not had a problem with quality. There are a number of suppliers who ship internationally by courier. Just check to see if they have a minimum order. This metal is best cleaned with a polishing cloth. Some liquid cleaners will remove the antique finish. It can be cleaned under running water with a soft brush. Tumble polishing will remove the finish from high spots on the item. Heavily oxidized items can be tumbled polished if you wish to lighten the finish. Store sterling pieces separately in an airtight container such as a zip lock bag.